At Westate Mining, we pride ourselves on delivering unique products to answer the needs of our clients. 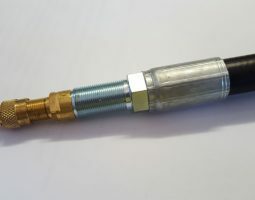 We developed our Magnetic Valve Protectors to provide a solution for a specific problem one of our clients was encountering onsite. Rock damage to valves and valve extensions can cause costly downtime and safety issues. Along with our Heavy Duty Valve Extensions, we have designed a magnetic-based valve protector plate. 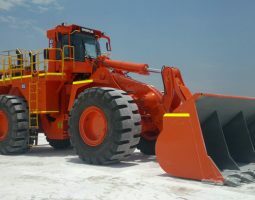 They use super strong rare earth magnets which clamp down on the base of earthmover rims, and are easily removed with tyre levers when required. Where inner and outer valves are located on a large dump trucks’ rear wheels, flying rocks can cause valves to be damaged and blow off. By using our Magnetic Valve Protectors, you save on the welding costs associated with traditional valve protection methods. Before we designed these innovative magnetic protectors, a protective bracket was often welded to rims, making removal and new tyre fitment tricky. Westate’s Magnetic Valve Guards can be re used if the rim is removed and allow for fast, efficient and easy placement by staff. Made with four extra strong rare earth protectors with an individual pull strength off 68KG, these guards easily secure to the base of Earthmover Rims. 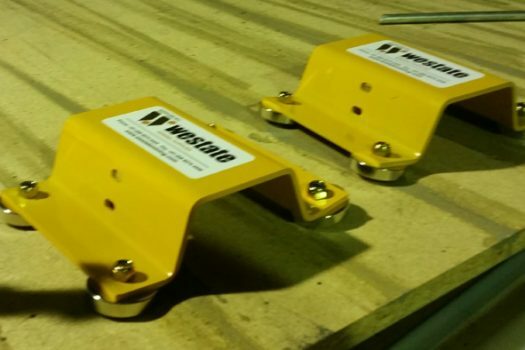 Comprised of 4mm pressed steel to the radius of rims 25” up to 63” in diameter, and powder coated safety yellow, consider switching to Westate’s Magnetic Valve Protectors today. Contact us today for more information about our Magnetic Valve Protectors.